Was it worth risking my life? Sure! | I Should be Writing! LOVE IT! (By the way, Andrew made it through Hell Week – just finished up today!! We get to see him tomorrow. Gotta love those SEALs!! Congratulations, SEAL Mom! They sure come in handy! We love our men in uniform. That’s great news. Awwww…*tearing up a little* What a great story! I’ve never been to NYC…but it is on my list! I have quite a long one. Thanks for reading, Aaron. How about this? When you get your big NY agent and I get mine, we’ll meet up and have lunch somewhere to discuss how many Hollywood types are vying for the movie rights. Deal? Thanks for reading, Aaron. How about this? When you get your big NY agent and I get mine, we’ll meet up and have lunch somewhere and discuss how many Hollywood types are vying for the movie rights. Deal? Thanks for reading, Kristin. I appreciate it! Great blog! I havent been to New York, either, but i know i will go there one day! Great job Kristine! Keep doing what you love! Kristine, you really know how to tell a tale. I could picture the bus scene. Your recounting of the dialogue is great. Additional details, please. Did you create the Phantom Peep? How’d you do that? It’s hard to tell from the blog picture. Six days and five nights in NYC for your first trip? Sounds wonderful. Was each annual trip that long? What did you order at the four-star restaurant? Was it four-star good? I’ve been to NYC, but never to a four-star restaurant. Your hubby is coming out smelling like a rose in your posts. What a good husband. 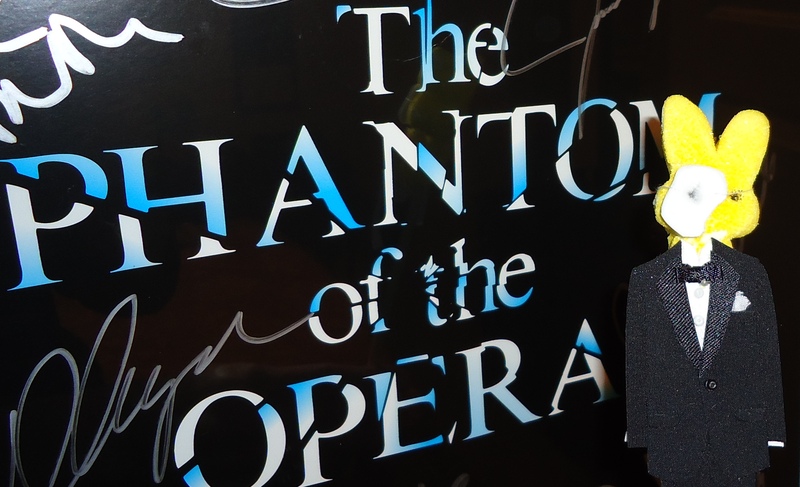 How many times has he (and you) seen the Phantom of the Opera? Hi Chris! Yes, I made the Peep Phantom. It’s called Peep Art. There are websites dedicated to this stuff. No, really! People get elaborate with them, too, making backgrounds and buildings etc. I can’t remember the name of the restaurant. I’ll have to see if he remembers. I can’t remember what I had for lunch yesterday, I’m getting so bad. For three years in late November, we went for almost a week. The trip we made in the Spring last year we only stayed for the weekend. He left for Texas the day after we got home and I was getting ready for the move. It was chaotic and I was lucky to get to go at all. Kristine: That’s me, too. My memory is crap. How wonderful to have the opportunity to visit NYC for a nearly a week for three years running. I remember hearing about the last NYC trip you took and seeing some of the pictures on FB. Very cool! Love it Kristine! Keep it up, you are a captivating writer! I LOVED our NYC trip that year! Granted, we didn’t get to see a Boradway show due to the strike, but I went back with girlfriends in the spring and had a wonderful time! Wish I lived closer. And by the way, I can totally see your bus adventure through the tunnel! I’ll never forget one of your stories of your 1st trip to NYC. The one with your son hiding in the back of your car on the way to the parent-teacher conference when your beloved husband mentioned what his favorite thing about the trip had been. Still makes me laugh. Yeah…that’s one for the therapist’s couch later in his life. LOL – that’s what he gets…listening to our private conversations. It made me laugh that the crusy old (I assumed old I guess) bus driver was brking orders to the Navy seal. He was old. He was quiet until the mishap though. Yeah, we got a good kick out of it ourselves.